Indian Prime Minister Narendra Modi has wrapped up his latest visit to Japan for the annual prime ministerial summit between the two countries. He and his Japanese counterpart, Shinzo Abe, concluded a range of agreements, including several significant measures on military cooperation and regional and global security. As my colleague Franz-Stefan Gady reported earlier, one of the most significant outcomes of the latest summit was the official start of negotiations between the two countries on an acquisition and cross-servicing agreement (ACSA), which will grant each of their armed forces reciprocal access to the other’s bases and military facilities. The move crystallizes more than a decade of rapid strategic convergence between Japan and India amid mutual suspicions about China’s rise. On security cooperation, the so-called special strategic and global partnership between the two countries continued to deepen. India and Japan have now elevated their “2+2” defense and strategic dialogue to the ministerial level. Additionally, the two leaders welcomed the start of tri-service exercises, which will involve interactions between the Indian Army, Air Force, and Navy, and Japan’s Ground Self-Defense Force, Air Self-Defense Force, and Maritime Self-Defense Force. An important area of progress on the security front this year came in the area of defense technology research and development. New Delhi and Tokyo are beginning bilateral cooperative research “in the area of Unmanned Ground Vehicle (UGV) and Robotics,” per the joint statement. The venture will mark another important area of development in defense industrial diplomacy for Japan since the end of its self-imposed ban on defense exports in 2014. Tokyo has similar cooperative efforts with a few other countries, including the United Kingdom and the United States, its treaty ally. Curiously, language on the long-pending deal for Japan to sell India its ShinMaywa US-2 amphibious aircraft was weaker than last year in this year’s joint statement. The two sides will continue to make efforts with regard to cooperation on US-2 amphibian aircraft,” this year’s statement noted. Last year’s language was more energetic, implying a potential transition was in the works. “Japan’s readiness to provide its state-of-the-art US-2 amphibian aircraft was appreciated as symbolising the high degree of trust between the two countries,” the 2017 prime ministerial joint statement noted. The Indian Navy’s interest in the system appears to be waning, especially as the two sides have been at an impasse over unit pricing. The deal hasn’t yet been declared dead, but it’s appearing less likely now than it did a few years ago. Fortunately, the India-Japan relationship has deepened and broadened to the point that a failure to conclude the US-2 deal after more than 5 years of negotiations would not be a major setback. On regional and global security, much of the remainder of the joint statement was familiar. Japan managed to insert a comprehensive paragraph on the Korean Peninsula, that included a call for “realizing North Korea’s complete, verifiable, and irreversible dismantlement of all weapons of mass destruction and ballistic missiles of all ranges in accordance with the relevant United Nations Security Council resolutions.” The Indian contribution to the language in this section related to “proliferation linkages” — a constant concern for New Delhi ever since North Korea transferred the Nodong ballistic missile to Pakistan, where it was modified to become the nuclear-capable Ghauri system. Similarly, as in previous prime ministerial joint statements between the two countries, the two sides condemned terrorism and called out Pakistan by name to hold accountable the groups behind the November 2008 Mumbai and January 2016 Pathankot terror attacks. Separately, both Modi and Abe reaffirmed each other’s push for permanent membership on the United Nations Security Council (UNSC). Along with Germany and Brazil, India and Japan comprise the so-called G4 group of countries that seek permanent membership on the UNSC. 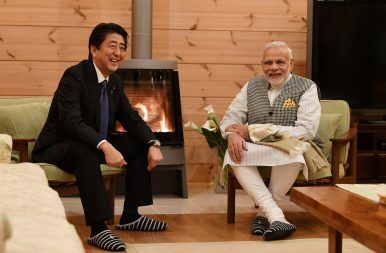 As far as security and strategic cooperation are concerned, the latest Modi-Abe summit demonstrated that India and Japan continue to converge. The two leaders too have known each other for more than four years now, enjoying longevity in their respective countries. Abe recently won the Japanese Liberal Democratic Party’s leadership for another three year term while Modi will face elections late next spring. However, the groundwork laid for the defense and security aspects of the India-Japan relationship can be expected to outlast either of these leaders.